Second, another surefire winner is the Seafood Skewers. You can nibble on it, pair it off with steaming rice, or down it with your favorite tropical drink. Just be sure to have plenty of it for it can disappear in a jiffy! 1. Skewer onion, fish fillet, green bell pepper, prawns, red bell pepper, pineapple chunks, squid and button mushroom on bamboo sticks. 2. Season with salt, pepper, mustard then pan grill the skewered seafood until done. 3. Reduction white wine in sauce pot, then add lemon juice and chopped parsley. 4. Remove from heat, add butter just to be melted. 5. 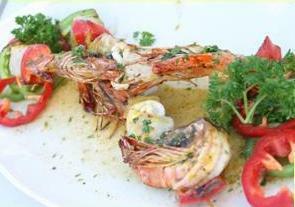 Place on platter skewered pan grilled seafood, then pour over with lemon butter sauce.